Can Iowa keep this up? Currently, Iowa sits at #2 in the Pomeroy rankings. The team has already swept Michigan State and beat Purdue in West Lafayette by 7. Fran McCaffery's clipboard supply has never been higher. The obvious answer is offense, as the Hawkeyes sport the league's best efficiency in conference games. That offense is fueled by a minuscule turnover rate and deadly-accurate three-point shooting. 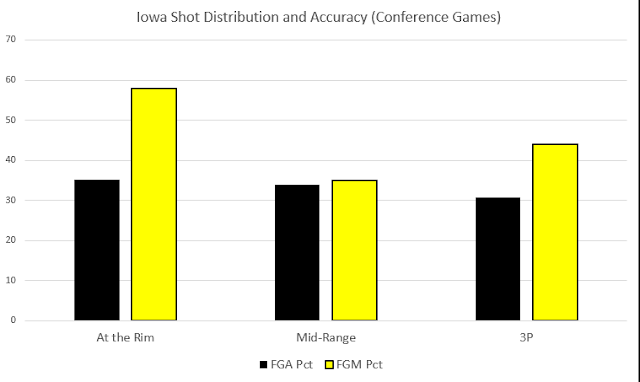 That's Iowa's shooting accuracy (yellow) and shooting distribution (black) for this season so far in conference games. The team is pretty even across the board, with at-the-rim shots slightly edging out mid-range shots. That's a good thing, even if Iowa is only making 58 percent of it's at-rim shots (which is, generally, slightly below the Division I average). Of course, this trick only works if there's someone to pick up the slack, and that's been a combination of Jarrod Uthoff and Peter Jok, who collectively attempt nearly two-thirds of Iowa's shots when they're on the floor (which is a lot). And Jok in particular has been excellent in converting his attempts (54.1 eFG in conference play). If it isn't clear already, Iowa's offense has only made slight adjustments from last year's version. And that's not too surprising, considering Iowa's offense was really good last year (2nd to Wisconsin's scorched-Earth attack). But what about defense? Last year's Hawkeyes were 8th in the Big Ten in defensive efficiency, this year's team is 4th. Can McCaffery's team keep that up? There, I'm less certain. 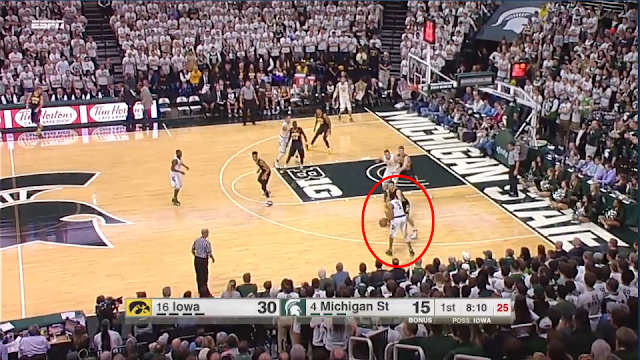 I do think that Iowa will continue to defend without fouling (this is a consistent strength for McCaffery's teams), but it's the two-point defense that bugs me. Despite a conference-leading block percentage (fueled by Uthoff's conference-leading 18 blocks), Iowa ranks just 8th in two-point defense. That's largely the result of the last two games, where Michigan and Michigan State each made over 55 percent of their 2s. Not coincidentally, Uthoff registered just 3 blocks across those games. So what did the Spartans and Wolverines do? 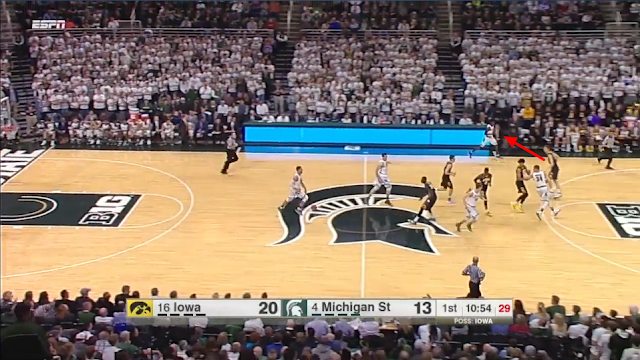 Well, the Spartans didn't seem to do a lot, it was really about what Iowa did. Here's Uthoff guarding Alvin Ellis on a possession Matt Costello scored on. Here's Uthoff picking up Eron Harris in transition. Costello with another layup. Here's Uthoff doing some olé defense on a Denzel Valentine layup. Overall, it just seemed like the gameplan was to protect Uthoff. And hey, he drew one foul, scored 15 points, and Iowa won. So it's hard to fault McCaffery for that. Of course, if they lost, the counterargument is that Uthoff had four fouls to give. As for Michigan, it's no secret what John Beilein does—he sticks 4 guys out on the perimeter, with one big man in the paint that often comes out to set a ball screen. More times than not, that big man will be guarded by the other team's center (i.e., Adam Woodbury, though sometimes Uhl or Nicholas Baer). With Michigan's dangerous shooters, that means Uthoff has to stay at home. So it's been a combination of Iowa being cautious and Michigan running its stuff. The good news for Iowa is that there's just one Michigan, the bad news is that there are plenty of other teams with a capable two-point attack. The matchup with Purdue this Sunday looms large for that reason, and also because should Iowa win, it will be extremely difficult to deny the Hawkeyes at least a share of the conference title.